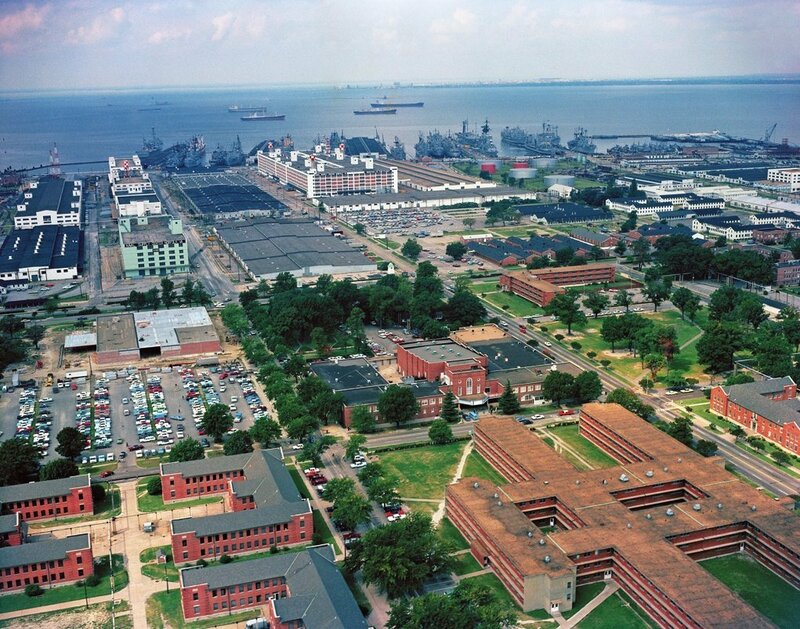 Naval Station Norfolk, the world’s largest naval station, occupies 4,300 acres of Hampton Roads real estate in a peninsula known as Sewell’s Point. When the 64 ships, 187 aircraft, 18 aircraft squadrons, and 326 tenant commands who call Naval Station Norfolk home are not deployed, they are alongside one of the 13 piers or inside one of the 16 aircraft hangars for repair, refit and training. The land on which Naval Station Norfolk is located was originally the site of the 1907 Jamestown Exposition. During this exposition, high-ranking naval officers agreed that this site was ideal for a naval activity. A bill was passed in 1908 proposing Congress allow $1 million for the purchase of the property and buildings, but it died when the Assistant Secretary of the Navy was given a choice between this property and a new coal ship. He replied that a new ship was an absolute necessity. However, immediately after the United States entered World War I in April 1917, the Secretary of the Navy was persuaded to buy the property. A bill was passed for the purchase of 474 acres; it set aside the sum of $1.2 million as payment for the property and an additional $1.6 million for the development of the base, including piers, aviation facilities, a recruit training station, a submarine base and recreation grounds for fleet personnel. Naval Air Station Norfolk started its roots training aviators at Naval Air Detachment, Curtiss Field, Newport News, nearly a decade later. 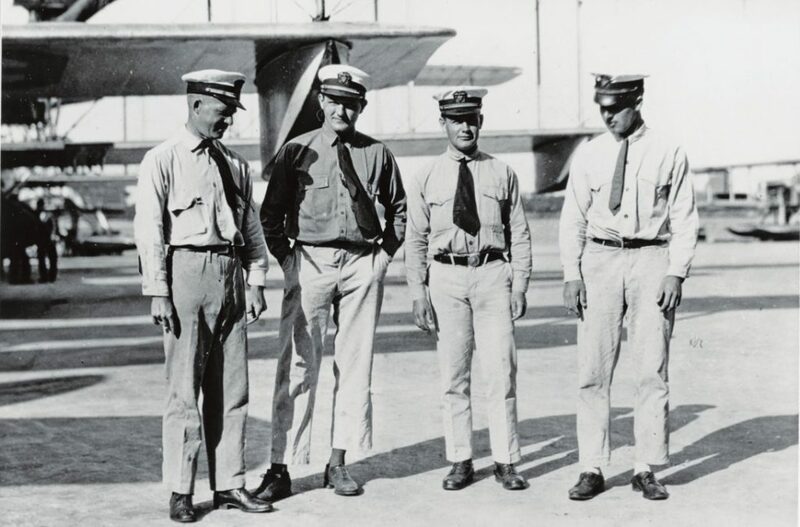 In August 1917, with a staff increasing to five officers, three aviators, ten enlisted Sailors and seven aircraft, the detachment was renamed Naval Air Detachment, Naval Operating Base, Hampton Roads. 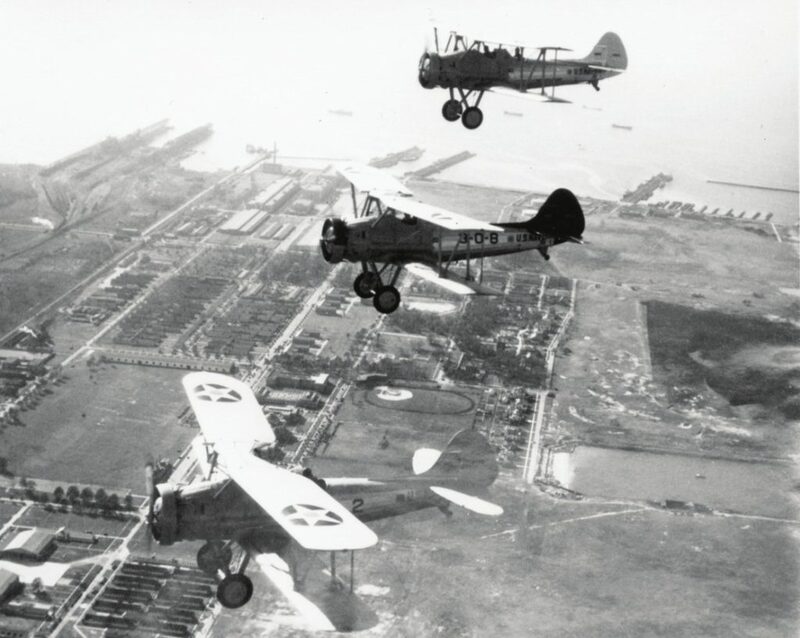 When the United States became involved in World War I, the size of the Navy’s air component was eagerly expanded. During the 19 months of U.S. participation, a force of 6,716 officers and 30,693 enlisted members served in naval aviation. The training of mechanics to support the aircraft began in January 1918 at the Norfolk detachment and the first patrol was conducted five months later. As World War I came to an end, the Naval Air Station grew to nearly 167 officers, 1,227 enlisted men and 65 planes. With the end of the war came the threat of demobilization and the end of naval aviation. However, the expansion of shipboard aviation in the 1930’s brought renewed emphasis to Naval Air Station Norfolk. President Roosevelt’s response to the start of the war in Europe resulted in growth for all Navy activities in the Norfolk area. By the summer of 1940 the Station employed some 8,000 personnel, a number larger than any time since the end of World War I. With the increase in personnel came an increase in construction. Hangars, a new dispensary, three runways, magazine areas, warehouses, barracks and docking areas were patterned after similar existing airfields. In June 1941, the personnel count at Naval Station Norfolk increased once again. There were approximately 10,000 new recruits at the Naval Training Station, 15,500 officers and enlisted on station, and 14,400 Sailors assigned to ships homeported in Norfolk. The increased pace of operations made it necessary to further extend runways and provide more parking areas. To accommodate this requirement, an additional 400 acres was acquired. By 1943, the Naval Air Station had become the hub for a series of outlying air-fields. 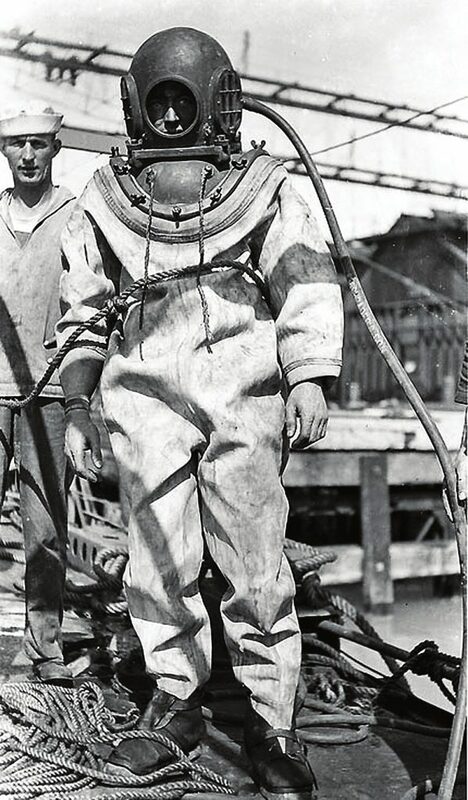 As such, Naval Air Station Norfolk’s biggest contribution to the winning of World War II was in the training it provided to a wide variety of allied naval air units. Known officially as Naval Operating Base until January 1, 1953, the name of the installation was changed to Naval Station Norfolk. Following World War II, the “air side” of the Naval Station continued to operate at near peak levels, serving as operational headquarters for the Fleet Air Command. With the establishment of Naval Air Station Oceana in the late 1950’s, the tandem formed the nucleus of the biggest air base on the East Coast. In 1968, Naval Air Station Norfolk assumed a major role in putting a man on the moon. The air station became Recovery Control Center Atlantic, providing command, control and communications with all the ships and aircraft involved in the recovery operations of Apollo 7. As part of the Navy’s response to the post-Cold War drawdown of the 1990’s, many new initiatives were implemented at Navy shore installations to reduce their operating cost, improve efficiency and better match their capacity to the reduced size of the Navy. One of the biggest steps and efficiencies in this process was the merger of separate Naval Station and Naval Air Station (which were directly adjacent to each other) into a single installation to be called Naval Station Norfolk. This consolidation became official on February 5, 1999. Following the October 12, 2000, attack on USS Cole (DDG 67) and the September 11, 2001, terrorist attacks, security gate upgrades began, culminating in more than $12.5 million worth of upgrades. 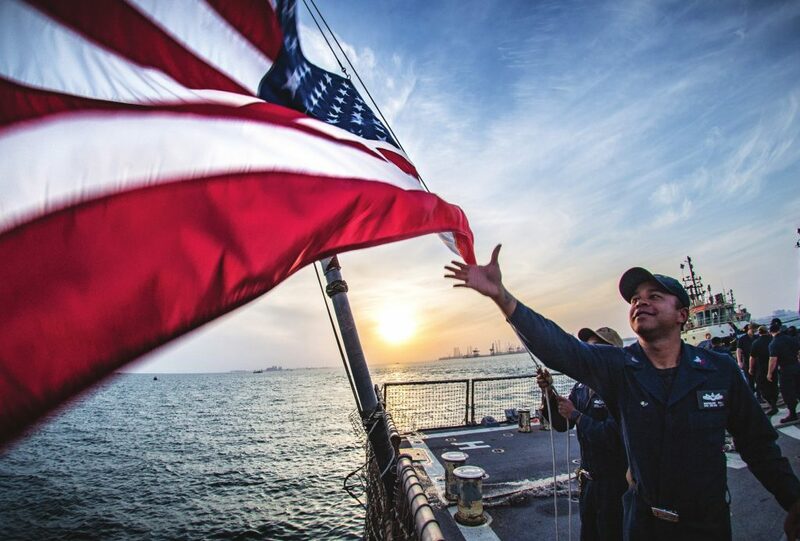 Sailors who call Naval Station Norfolk home continue to support missions abroad, such as the Global War on Terror, and those hitting closer to home as with Hurricane Katrina in 2005 and the Haiti earthquake in 2010. Sailors operate, train and prepare to increase their readiness and provide significant combat power when and where it’s needed.